For all general inquiries, or in regards to weddings or baptisms, contact Minister Ross Hathway via telephone on (02) 4821 4976 or via email in the fields to the right. 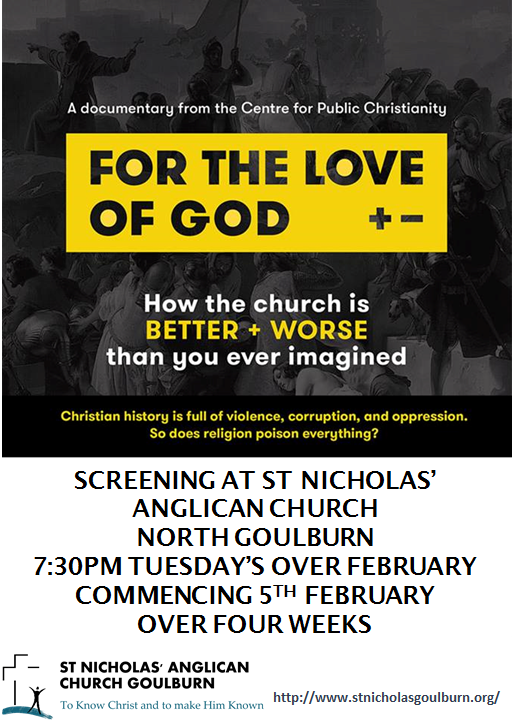 THIS TUESDAY NIGHT: on "For the Love of God"
Join us as we screen this four part documentary over the four Tuesday evenings of February 2019 (Feb 5, Feb 12, Feb 19 and Feb 26) commencing at 7:30pm, and together weigh up the good, the bad, the ugly - and the unexpected - about the impact Christianity has had on the world we live in. Doors open 7:15pm. All are welcome! Christian history offers plenty of ammunition to its critics; crusades, inquisitions, witch trials, the oppression of women... For the Love of God, a documentary by the Centre for Public Christianity, confronts the worst of what Christians have done but also traces the origins of Western values like human rights, charity, humility, and non-violence back to the influence of Jesus. February 5th - Episode One: War and Peace. February 12th - Episode Two: Rights and Wrongs. February 19th - Episode Three: Rich and Poor. February 26th - Episode Four: Power and Humility.